Live from San Jose, California, Halfdan Hussey and his Cinequest crew revealed their programming for this year’s Cinequest. We’ll have more on it a little later tonight, but the biggest news for Fanboys is that the Prince of Stories, Neil Gaiman, will be the recipient of this year’s Maverick Spirit Award, and will be attending the Festival to accept on Sunday, March 9 at 1:30 p.m.
Often Neil Gaiman’s works get categorized as Dark Fantasy, because we love dividing and subdividing genres. But Neil’s work strains against such limitations, starting from his first major work in the U.S., The Sandman. He can’t even be limited as a writer, playing in as many different forms as he can – comics, short stories, poetry, novels, and screenplays have all sprung forth from his fertile imagination, yet his earliest writing was as a journalist, profiling the likes of Duran Duran and Douglas Adams. In recent years he has become a producer and a director, all while continually evolving as perhaps his most charming aspect: a true raconteur. If his own story must have a beginning, it was in Hampshire, U.K., though he currently lives in the U.S. For those early days he describes himself as “…a feral child who was raised in libraries.” Becoming a voracious reader himself, it seems destiny guided him to his role as “Prince of Stories” – the title of a critical retrospective of his work. Though he seeped into our consciousness with an ad in DC Comics declaiming “I will show you terror in a handful of dust, “ it was wonder, not terror, that dawned, as mythologies old and new were turned on their heads and woven into an original epic that he revisits from time to time. Neil awakened readers to things we must have always known, but somehow we needed him to give us the words. In collaboration with Terry Pratchett, he offered us Good Omens. He wrote of Fragile Things and American Gods with equal weight; after all, he made us realize they are the same. And he inspires wonder for all ages. While he has taken adults to Neverwhere, he reminds young and old to seek magic in Stardust. For the very young, he taught The Dangerous Alphabet and remembered The Day I Swapped My Dad For Two Goldfish. Perhaps fulfilling a dream of that feral child in the library, Neil even got to write an episode of Doctor Who in 2011, “The Doctor’s Wife.” There’s more, of course, including a bestselling novel just this year, The Ocean at the End of the Lane, but Neil is also busy in other media. Having turned producer for the film of Stardust, he has also directed two short films himself, one starring his wife, musician Amanda Palmer. And it is with Amanda, perhaps, that we can at last find a definition for Neil’s work. In the purest most Shakespearean sense – encompassing terror, adventure, magic, wonder, heroism, heaven, hell and love – Neil’s work, his gift to us and to himself, is Romance. 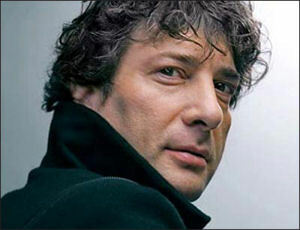 The Maverick Spirit Award will be presented, along with a Q & A with Neil Gaiman at the San Jose Repertory Theater on March 9th, 2014 at 1:30 p.m.